Chhaya Devi (1914–2001) was an Indian film actress. She has acted in hundreds of Bengali, Telugu, Tamil and Hindi language movies for over five decades and played many character roles. Her first lead role was in Sonar Sansar (1936), directed by Debaki Bose, and later with Bidyapati (1937) she received acclaim and went on to act in notable films like, Nirjan Saikate (1963), Hatey Bazarey (1967) and Apanjan (1968) by Tapan Sinha, Saptapadi (1961), Uttar Falguni (1963), Antony Firingee (1967), in Bengali, Alaap (1977) in Hindi, which also starred Amitabh Bachchan.She played many roles like Revati in mythological films of Maya Bazaar (1957) and others. 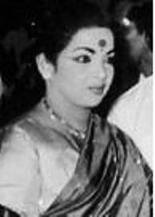 In many Telugu social films, she played roles against another veteran actress Suryakantham. She was first cousin of actor Ashok Kumar's wife Shobha Ganguly, thus related to the Ganguly family.